This Italian dessert was in my "must try" list of foods when we visited Rome. After a day of endless sightseeing of the Vatican and its many splendors, we could take in no more of the magnanimity of the statues and the grandeur of marvels man could create from his imagination. The delicious dessert I relished in the little, unassuming cafe of the Vatican Museum opened up a whole new dimension to my concept of desserts. 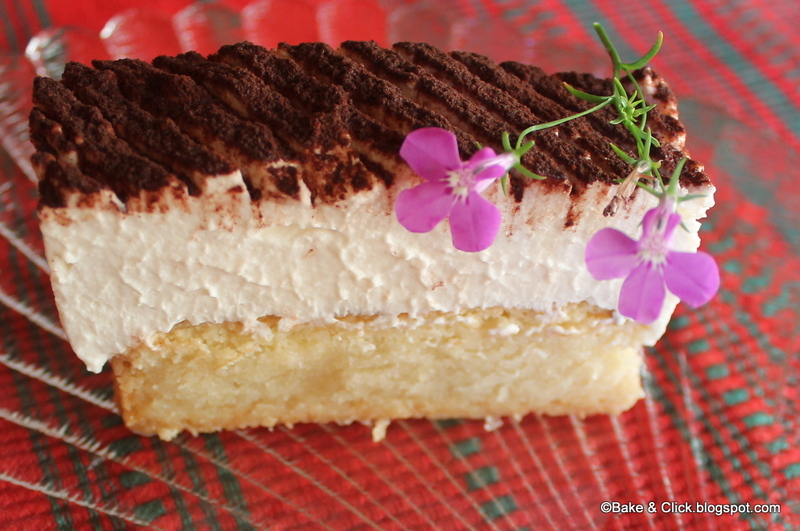 I have had many a tiramisu in later years, but none better than the one I first tasted- sublime yet simple. When I recreated the recipe, I skipped the addition of coffee (I don't appreciate caffeine in desserts) and raw eggs (even lesser appreciated) from the traditional recipe. Ideas poured in through various sources and finally my taste buds came to a consensus as to create the recipe below. I realized it’s a flexible dessert- when I swapped a box of yellow cake mix for the base layer instead of the lady fingers and doubled the mascarpone recipe for a larger dessert for 20-24 colleagues at work. The cake can be baked in a baking tray and used as a single layer or layered to two and assembled with alternating layers of mascarpone cheese. For coffee lovers, the soaking solution would definitely be freshly brewed coffee. Just go ahead and discover what's best for you. 1. Take the sugar and water in a small saucepan and dissolve to make a sugar solution, over low- medium flame. Keep the solution aside and once cooled fully, add the red dessert wine. 2. In a chilled bowl, whip the cold heavy cream until it forms soft peaks. 3. In a medium bowl, blend the mascarpone and sifted confectioners' sugar until smooth. Add the red wine and combine. 4. Fold in the whipped cream into the mascarpone mixture and beat for just 20 seconds. 5. Line a 9 x 4 x 2.5 inch (23 x 8 x 6 cm) loaf pan with plastic wrap with overhangs on all sides. 6. Dip the lady finger biscuits in the soaking solution and arrange as a layer in the pan. Take care not to soak the biscuits for too long. 7. Next add the mascarpone cheese layer over the biscuits and carefully smooth out the top. 8. Chill the tiramisu in the refrigerator for 6 hours or overnight. 9. Once ready to serve, pull the tiramisu out of the pan with the help of the overhangs and keep on serving plate. Garnish with cocoa powder and chocolate shavings. 1. Grease, line with parchment and flour a 11 x 7 x 2 inch (28 x 18 x 5 cm) cake pan. Preheat oven to 350o F (177o C). 2. Bake the cake as per instructions on box. 3. Cool the cake and place it on a rotating table. Cut into two equal horizontal halves using a wire cutter. 4. Soak the first layer with the solution and wait for 5 minutes. 5. Layer half the mascarpone cheese over the cake layer. 6. Spread a generous amount of chocolate shavings over the cheese layer. 7. Continue in the same way using the next layer. 9. Once ready to serve garnish with cocoa powder and chocolate shavings.